Who doesn't love a great pizza? Most Americans do, as 41% eat pizza weekly, and 68% order pizza to go at least once a month. While one-third of adults recently reported eating out less often - suggesting a new restaurant recessions - pizzerias seem to be exempt from this trend. At the end of 2016, it was reported that pizza is a $45 billion industry in North America, having grown even more form the previous year. So what is it about pizza that keeps the funds flowing for restaurant owners? Perhaps it's the food's ability to maintain a classic feel combined with a modern flare of new flavor. Somehow, pizza has managed to stay stapled in American food culture while adapting to the times and being subjected to countless new pizza trends. Now that we're a half way through 2018, let's take a look at this year's most notable pizza trends and how restaurants and pizzerias can decide their best course of action. Growing up, I always associated square pizza with made-in-bulk pizza, oftentimes served in school cafeterias. Turns out, that's not exactly the case anymore. Say hello to Detroit-Style Pizza. Aside from its distinctive square shape, this style is known for flipping the traditional pizza model on its head - literally. Toppings go first, covered by cheese, then sauce. Despite its rather unconventional appearance and preparation method, it's making a splash in cities outside of Detroit - notably LA and Austin. 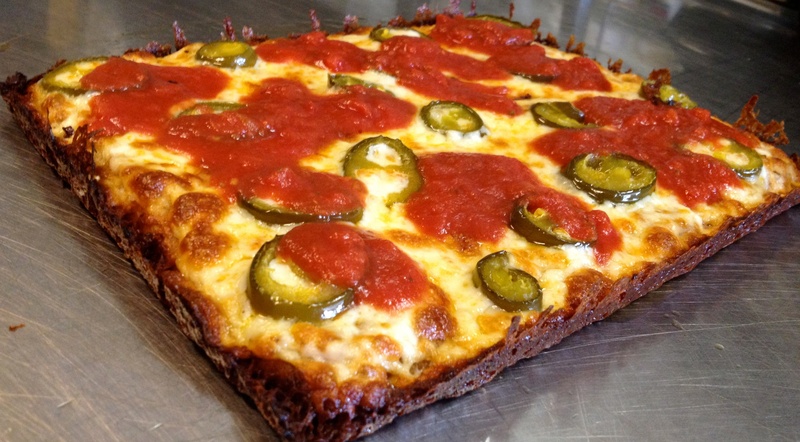 If Detroit-Style Pizza isn't being demanded in your city right now, it probably will be soon. Brandon Hunt, owner of Via 313 in Austin, told Eater he thinks Detroit-Style Pizza is "going to be on the same level as New York and Chicago" style one day. Whether or not Detroit-Styleis the new norm, we have yet to see. Personally, I can't say I won't subconsciously be disinclined thanks to memories from lunchtime in 3rd grade. But to each their own! Fun fact: This deep-dish pizza is synonymous with Detroit because the pans first used to bake them doubled as trays in Detroit's booming automotive industry! 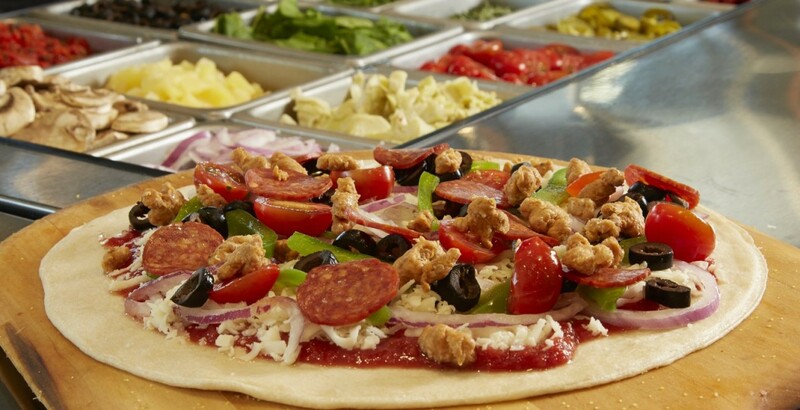 One pizza, one price, and all the toppings you could want. What part of that does not sound awesome? As an avid pizza eater, I can tell you that nothing there does not sound awesome. Fast casual restaurants are popping up all over the place. In my city (Boston), we've had Blaze Pizzas and Oath Craft Pizzas opening up all around my office and apartment building, while the rest of the country is being flooded with Pieologies and Pie Fives. The concept is simple - line up like you would at a Subway or a Chipotle. Choose your crust, sauce, cheese, and toppings. Minutes later, you're presented with your very own customized pizza at a reasonable price. Now, some would argue that fast casual pizza is just a fad. Well, there are arguments both for and against that idea. According to Forbes, Blaze Pizza was the fastest-growing restaurant chain in 2015, coming in hot with a 205% increase in year-over-year sales, while Pieology is on a similar growth track. However, if you're a classic, well-respected neighborhood favorite worried about being disrupted, don't panic just yet. Not all markets have embraced the fast casual trend with open arms. It was recently reported that Pie Five will be closing all of its company-owned locations in Chicago, as the concept "just didn't take off in Chicago the way (executives) expected," according to Pie Five Spokeswoman Jami Zimmerman. I guess that's a warning for all aspiring pizzeria owners in Chicago - it might not be best to mess with deep dish. All other cities, prepare yourself - dawn is approaching. Admittedly, this has less to do with the making of pizza and rather that ordering and receiving of pizza. Let's first look at Domino's. Love it or hate it, it's one of the most popular pizzerias in the world, and in part, that's due to its use of technology. With stock prices steadily on the rise since 2012, Domino's has surged not only in market share but also in its adoption and implementation of both employee-utilized and customer-facing technology. "The more that digital technology becomes the default way that people are going to access brands—and it is already the majority of our business—I think that’s going to continue to play to our strength,” says Domino's CEO Patrick Doyle. 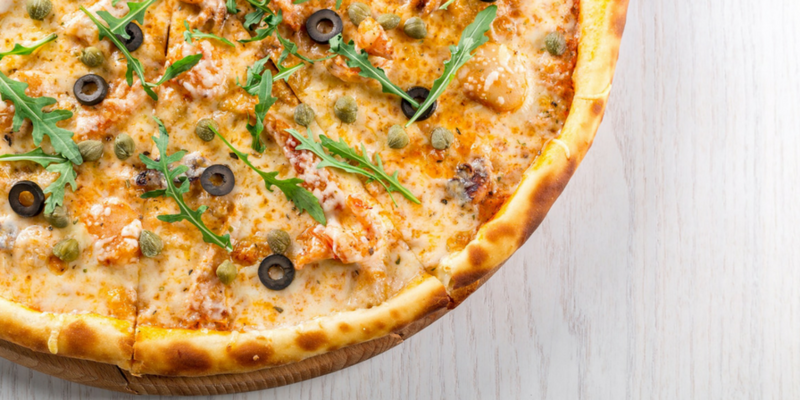 Statista also pointed out the sheer growth that online ordering from pizzerias will see, while the NPD Group found that digital ordering increased by 18% in 2016. Pizzerias looking to capitalize on online ordering have three options moving forward. The third-party site, where your name is listed among all the other restaurants delivering nearby. Good for exposure but bad for per-order profit, these sites tend to take hefty fees on each submission through their site. A restaurant app. Restaurant industry analyst Bonnie Riggs commented that “Digital ordering is now really all about the mobile app." While revolutionary, this app may not yield the greatest return on investment for small, independent restaurants. An online ordering system integrated with your POS. You can send customers there and plan to pay one fee instead of a charge for every order, plus it's accessible on a desktop and mobile. In 2016, word got out that it was bad news for independent pizzerias. 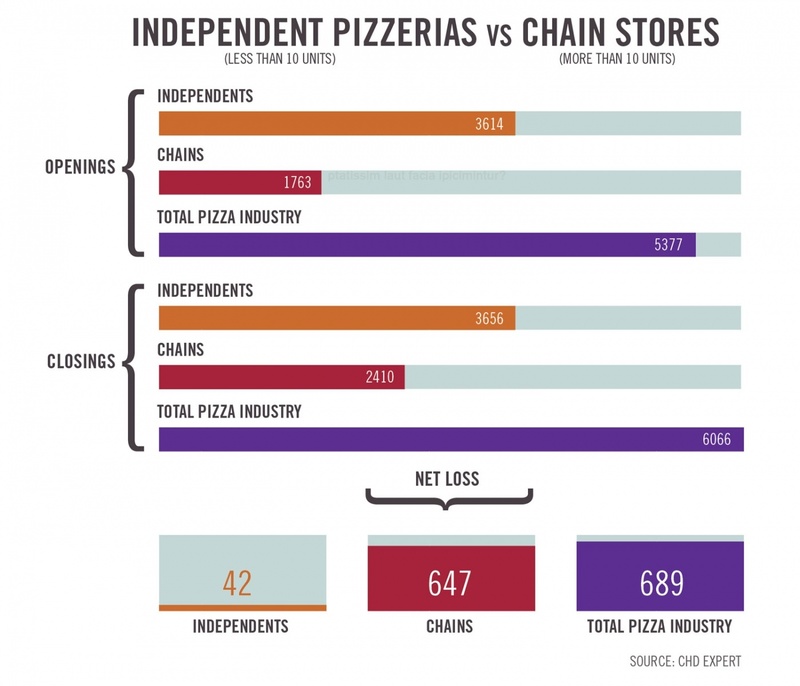 In PMQ's 2016 Pizza Industry Report, it was found that for independent pizzerias with less than 10 locations, "sales dropped by 5.01%...while chain operators (10 or more units) logged an increase of 3.38%" in the previous year. This wasn't the greatest news for independent pizzerias. However, it turns out this trend may have been only a temporary setback. In PMQ's 2017 Report, the results were much more positive for independents. Comparing the amount of location closings between independents and chains, chain locations comparatively struggled, hinting that independents had regained their footing against the bigger players. Keep your chins up, independent pizzerias! By sticking to your core values and staying true to the regulars in your city or town, you've got a great chance of long-lasting success in the pizza business. No, I'm not referring to the first thing you get your hands on after a night of an unrestrained good time. I'm referring to eggs instead of tomato sauce and bacon or sausage (or both) on top of the cheese. That's right - breakfast pizza. 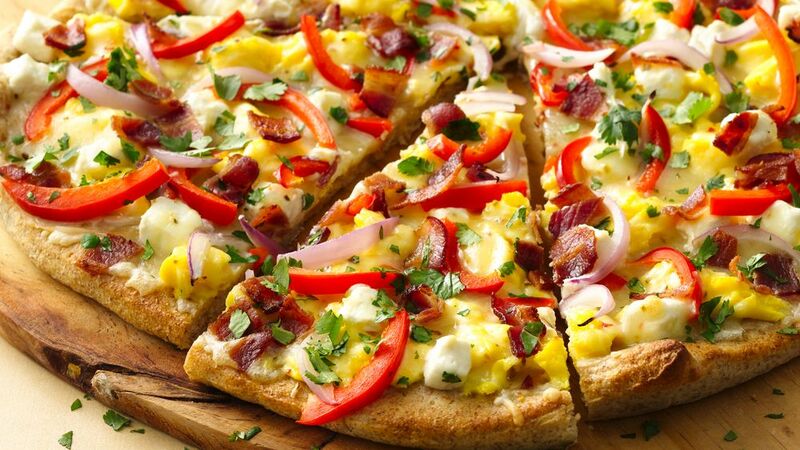 In January, 7-Eleven announced its launch of breakfast pizza. Could this be the first of many businesses to do this? One of my favorite parts of working in a pizzeria was being able to sleep in most mornings to avoid rush hour and school buses. Naturally, this way of life would have gone by the wayside if we ever served breakfast pizza, because we'd probably have to open our doors before 10:00 AM to make it a profitable venture. However, if you're eager to jump on this trend while it's still growing, consider opening up a few hours early and offering a commuter-sized breakfast pizza. After all, who has time to make breakfast in the morning these days? Which pizza trend are you most excited about this year? Let us know in the comments below!